We recently had one of the most fun craft nights ever, so much that I had no choice but to order these make at home kits, 2 more times since! Well, we did use a couple for a birthday gift and I am still hearing about how much fun they had with their family craft night! Not only do craft nights promote quality time together, no need for screens, minimal technology, if any, learning to follow instructions, yes, there is also reading involved! But, craft nights always seem to give a boost of confidence. I don't know what could be better then giant smiles, hugs, squeals and your little one's shiny, happy faces when they realize that they just learned something new and they are so proud that they just created something from a few ingredients or supplies. It has to be one of the best feelings in the world! Ok, so, we attempt to make our own everything, (almost everything), at least once. Anything from lotions to lip balms to cheese to now, gummies, chocolates and bubble gum. 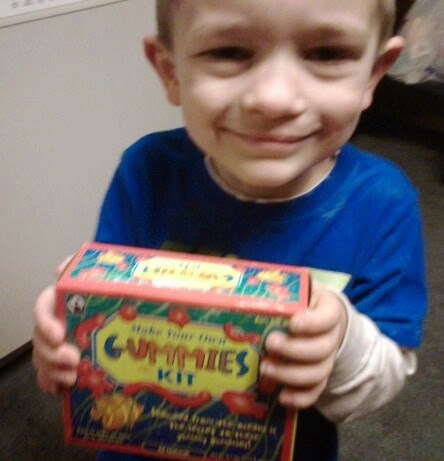 I came across these kits after a Twitter party, with a few sponsors who create healthy snacks, candies, sweets, basically, everything kids love. and now we can love giving to them, since they are organic, all natural and free of dyes and all of the other icky stuff we don't want going in our bodies, especially not in our children's bodies! We have been using Glee Gum at our house for a few years now. Glee Gum is aspartame free and Fair Trade! (Fair Trade is another certification I look for when deciding on purchases and products for our house.) I always check the Fair Trade website for any possible matches for cooking, baking, food, beverage and snack options. 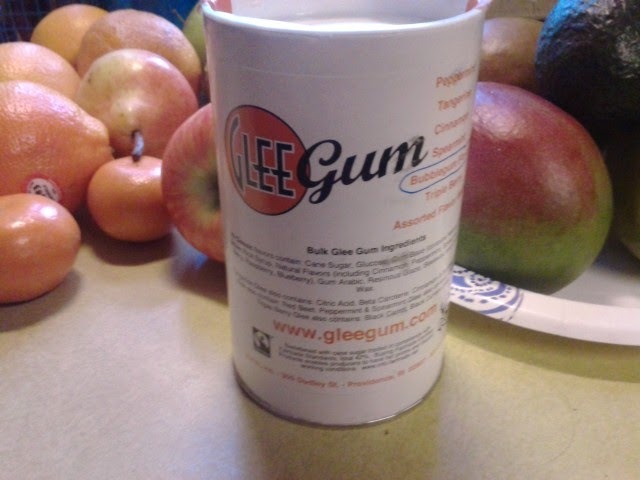 Glee Gum comes in a variety of flavors and at a very reasonable price. We usually opt for a canister of the "Assorted Flavor Medley" but you can always purchase a canister of your favorite flavor! They have classic bubblegum flavor, spearmint, peppermint, tangerine, triple berry and cinnamon. They come in these cool cans that we are planning on repurposing, possibly into pencil/pen/colored pencil caddies.... not sure just yet. Anyway, if you go to Gleegum.com, you can find all kinds of nifty things to grab for your kiddos and stock up on some tiny sample packs of gum, a classic gumball machine or these neat reusable cans! I don't know why I didn't know that, Gleegum, sold these do it yourself kits before that Twitter party. But, once The Gleeguy mentioned that they offer them, I had to go check it out! (By the way, if you are on Twitter and you communicate with brands, The Gleeguy will respond!) When a brand takes the time to have a conversation with us, reply to questions and comments, acknowledges your comments/concerns, shows up for a Twitter party and is happy to get to know us, that is the brand I am going to go after and find in stores or online, before others. I know they are busy, I understand they sometimes get swamped with requests and at times, I'm sure it is stressful and hard to get back to every single person who tries to get their attention, so, the fact that they care, proves to me, they are a good company. Ok, so, onto these exciting DIY kits!! We voted and we like all 3 the same, so, I can't specify which one is the best, so, just grab all 3 :D Make sure you check their site for a special deal when you do buy all 3 kits! The, Make Your Own Chocolate Kit comes with a couple cocoa beans for you to try! 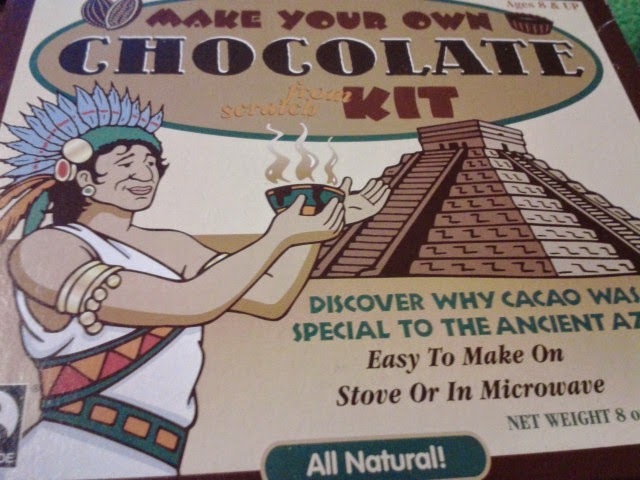 You also get a little instruction booklet that includes, The Story Of Chocolate. (Another reason I love DIY so much. They are always learning and they don't even know it!) With the chocolate kit, you will have enough to make 8 oz of chocolate. Oh and guess what else?? It's all natural, of course! 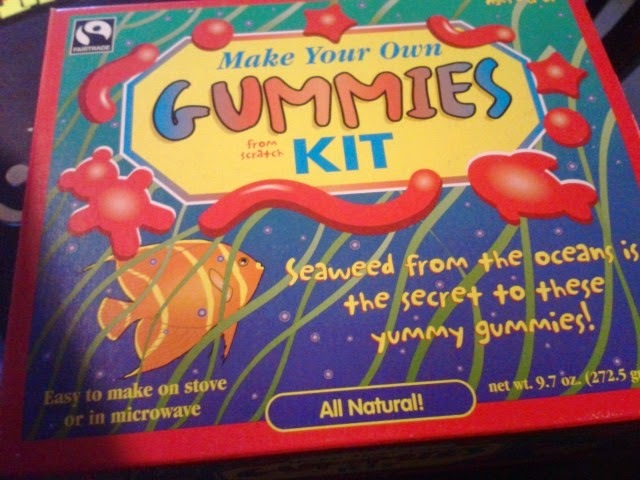 The next kit we adore, is the Make Your Own Gummies Kit. (Yep, all natural!) This was a bit messier, but only because I had 3 kids attempting to make their own molds with the included molding starch. 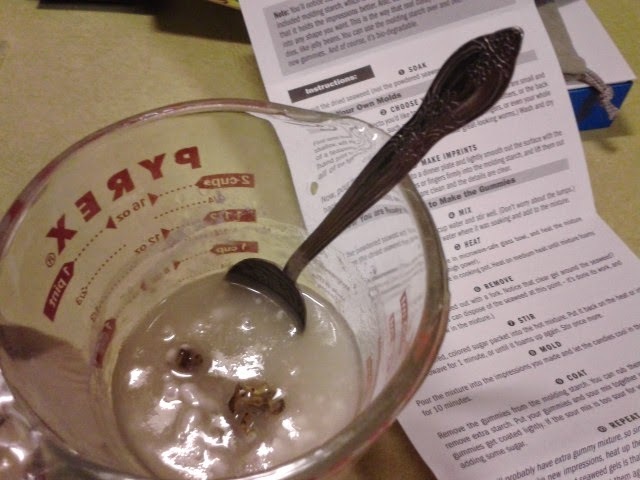 A brilliant addition, however, I quickly found plastic molds that we had lying around and they worked perfectly! We made butterflies, hearts, Lego minifigures and a few animals, flowers and bugs. 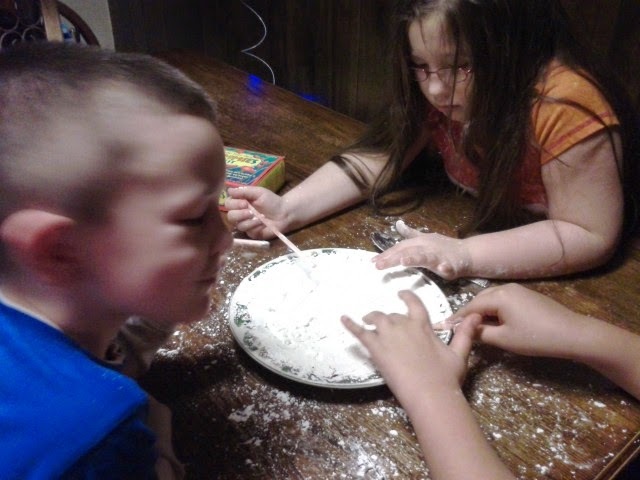 Of course, this is another learning adventure and it is easy enough for your kids to help. (You should be present of course, as with any DIY. You will need to heat up some ingredients and seaweed.) Yes, seaweed! Much healthier then what commercial gummies are made with! Here is the seaweed coming out of the microwave. 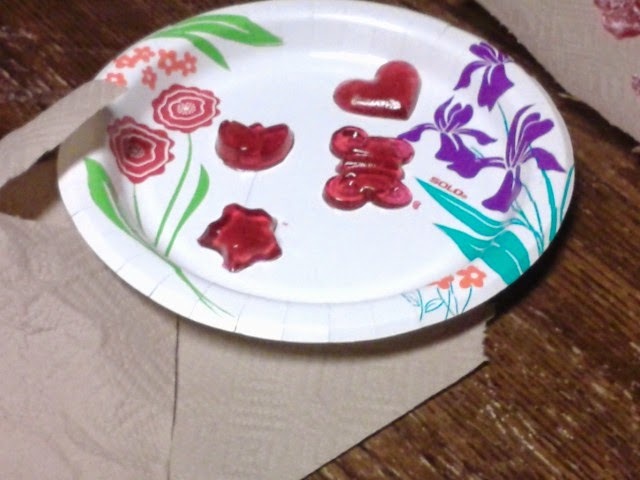 Here are some of our pretty gummy candies! 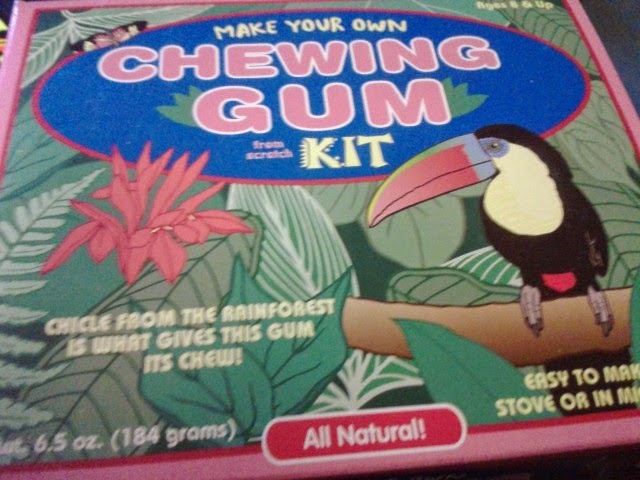 The Make Your Own Chewing Gum Kit makes about 50 pieces of scrumptious bubble gum. (Plenty to share between a few kids!) This kit is also very easy for little ones to help with and you get to learn about the story of chicle! Everything you will need is included in this kit, except for the microwave. (Or stovetop, whichever you prefer.) That is one big bonus with all of the Glee Gum's Food For Thought products... everything you need is inside the box! You just have to check out their product lineup! Bubblegum, Bubblegum machines, DIY kits, sugar free gum, gum pops, and don't forget to grab some penny gum with your order! My kiddos love the little 2 piece sample boxes we get with our order. (You pay just 8 cents for 8 packs!) These are perfect for when you're running errands and I know my kids love tiny things, lol so, tiny packs of gum are sought after here. Have you ever tried any of their products?